The Hit community · Posted in @Dev Any updates? You guessed right. Most of what I've been doing lately is refactoring and streamlining my code. There's an awful lot of it, and the complexity of the codebase has been slowing me down a lot when actually I've found time to work on the game. So, the constructor system (which makes every object in the game, and is in charge of un-making it when the damage system demands) has been getting a massive overhaul recently. It's a lot more usable than it used to be, and it's mostly in pre-compiled classes now, so it's not taking up any compile time while I'm working on other things. I've been working on a bunch of other systems, but that's been taking up most of my development time. Apologies for the silence, I haven't really had anything exciting to post for a while, but as soon as I do, you'll be hearing from me. Thanks for the post, It's awesome to see that there's still some interest in this game, despite the lack of updates. The Hit community · Posted in Paid version controls? Hey. It's right-click to enter interact (focus) mode, and left-click to interact with a scene object when the focus highlighter is over it. The gun is in the top left drawer of the chest of drawers in the starting hotel room, and will automatically be equipped when you pick it up. Focus mode is still a work in progress; I'll do a blog post when more of the interaction features are complete. Thanks, that's awesome news. Those flat blocks in the background are intentional; they're showing where the next building floors are going to be. I'll turn them into new buildings soon. New version's up. I've removed every instance of the glitchy material, as far as I can tell. Anyway, thanks so much for letting me know. Hey ruckus. Sorry about the build. I don't currently have a Mac to test on, so the Mac version is kind of a shot in the dark. I'll get hold of one as soon as I can, hopefully later this year. Also apologies for taking so long to get back to you; I've just moved house, and it's taken 3 weeks to reconnect the internet. Thanks, Daza. I've hopefully sorted out all the old materials now, and that should all be fixed in the next update. Yes, you can open and close doors. I've just disabled the interaction in this version because I'm still working on it. Basic interaction actually works fine, but I'm adding more levels to the system, so that objects can have more than one option (take, push over, wield as weapon etc.). I'll update as soon as that's in place. Oh, that's fantastic news. I've just noticed the gallery's actually using an old material, so that just confirms the fix has worked. I'll do a check for materials, and get those updated next. Thank you so much for testing that out. I've uploaded a new build, with the attempted fix in place. I'd love to know if it looks any different at all. Even a slight change might mean I'm on the right track. Okay, I might've just figured out what's going on. It'll take some rewriting of the constructor system, and I won't be able to test it myself. Daza & vcatkiller, do you mind if I message you when I've got a new build and ask you to test it? One thing that might help; Is there anything in the demo that doesn't glitch out, or is it all like this? Thanks! If you press the RMB, the camera will zoom and you'll be able to find out what the distant piles are. That's a secret undocumented feature I... er... probably should've documented. Update: Secret feature no longer secret! Not sure why it's doing that. It should be locking and hiding the mouse cursor, at least until you press escape or alt-tab to another program. Thanks for the feedback! Yes, I can fix the money texture. I've already got the code for making meshes and assigning UVs, I was just using a worldspace triplanar shader to get something up and running quickly, and didn't find the time to redo it. That's top of the list for changes, but I'm waiting til after the judging's over. Thanks, and I completely agree with the criticism. I had intended to add groups, but didn't manage to spend anywhere near the amount of time I wanted on this, due to spending most of the weekend being ill. If you grab the downloadable version, you can check out the different categories, which was the first step towards adding groups. I was wondering how to compare the amounts better, but hadn't even considered letting you carry the blocks. I'll have to implement that when I come back to this. I've been meaning to put in the rest of the data from the original comic, so that'll be an easy extra feature I can add. Cheers! Me too. 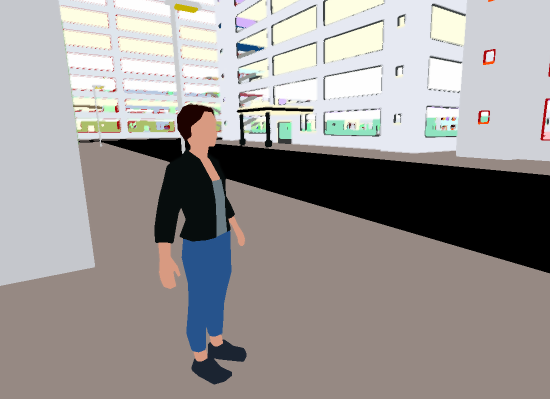 I'm working on a procedural city game that's crying out for a VR mode. Rift. I was one of the original Kickstarter backers, which is why I own a nice VR headset I'm currently unable to use. Thanks. I actually own a VR headset, but my PC's not beefy enough to use it. I'd like to add some extra graphics sometime, like portraits leaning against the piles, or simple 3D models. You can actually add custom amounts yourself, by editing the text files in the data folder, or adding new text files. As long as you keep to the format "Name of thing;1000" on each line, and don't leave any extra info or blank lines, you should be fine. The Hit community · Posted in I take it you need to buy the game to see latest builds? I'm not sure it's Windows 10, unless it's a conflict with NVidia cards on Win 10. I've been using a Windows 10 laptop for the bulk of the development lately, but with an onboard graphics card. I desperately need a better PC, so I'll look into getting one with an NVidia card as soon as I can afford it. I'll get it working, if I have to port the entire thing to Unreal Engine! Just without being able to replicate the bug, I can't start doing any tests to track it down. Hey Daza, thanks for your interest. The glitchy textures are an issue I've so far been unable to replicate, and none of the solutions I've tried have worked. I've tried it on several different PCs, but with no luck. I've been meaning to take it to Unity Technologies, but my main priority has been getting the narrative system working. I'll get it sorted, but I don't know when, sorry. You're absolutely right about the free demo. I've been iterating a lot on the core code, in order to get the narrative hooks in place, so gameplay has taken a back seat, unfortunately. I've had previous builds with some of the gameplay working, but it inevitably gets broken when I rework systems, so I've been putting it off until the important systems are all in place and working. I'm starting to focus more on the interaction systems, so I'll be adding weapons very soon. Maybe even a zombie apocalypse mode, to test those systems. I'll try to keep the free build updated regularly, but the interaction system (and therefore weapons) will always be disabled in the free build. Anyway, thanks for downloading the demo. Sorry it doesn't work properly on your computer, but it would really help me if I knew what your PC specs are (graphics card, CPU etc.). Incidentally, this page was never supposed to be public. I created it after receiving a couple of requests from interested gamers, and it only went public after RockPaperShotgun published the link. I know that's not really an excuse, but I'm working hard to make it worth your time. v0.04 The main game's done, with four difficulty levels and a simple scoring system. Next version will keep track of scores for each difficulty, and hopefully have a few less bugs. Maybe even Oculus Rift support, if I can find the time. This is still a work in progress. i'm hoping to get one more build done before the deadline, with music, more sound effects and a working score system. I'd also love to add melee weapons and guns, but I doubt I'll have time. The Hit community · Posted in Will I get a steam key ? I don't see any reason why not, but I'm reluctant to make any promises right now. The itch.io page was set up mainly to allow a very few people who'd been hounding me to see what I was up to. I haven't been pushing it because I honestly don't think the game's worth your time yet. The RPS article has resulted in a bunch of purchases I wasn't expecting, and me having a minor panic attack trying to figure out how to get the game to a fully-playable state faster. If it matters to you, I'd suggest waiting until I release on Steam. It won't be too much longer, and when I hit the button you'll know that I consider it worth your time. I'll also update the itch.io page with a definite statement about Steam keys then. Apologies for the vagueness, I'm just trying to save my sanity and your time. 1) I'm working on the single-player mode first, but multiplayer is planned for soon after release. I'll talk more about the multiplayer modes then. 2) Yes, absolutely. All future builds will be free if you've bought The Hit from here.